On Tuesday morning, 24 March 2015 I woke up before sunrise and headed up the hill to the top of Mt. Thesiger at around this spot GPS: -31.603330, 29.527454 Port St John’s. I set up my Canon South Africa camera from Orms (6D & 17-40mm L lens) and tripod in anticipation of the forthcoming sunrise. The river lodges were some 300 m or more below and could faintly see their lights through the mist or low clouds. It was calm, peaceful and dead quiet except for the medium-size predatory birds that were circling the mountain and squawking at each other. Every so often they would fly fairly close and it was amazing to hear their wings “woof – woofing” through the air. The view across to Mt Sullivan on the other side of the river was glorious to say the least for about three minutes or less at one point of the sunrise. The sun then “disappeared” but not completely, although there was no more golden light forcing through the somewhat thick clouds. 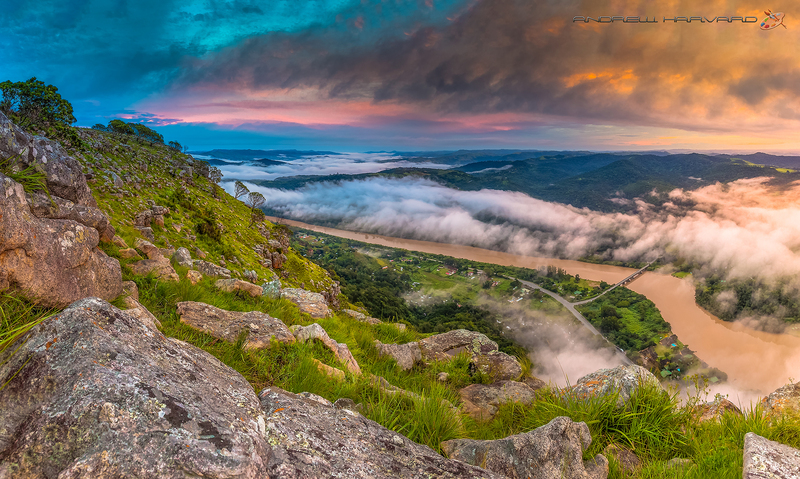 The accompanying photo is a panoramic-stitch of two separate photos, which takes one’s eyes in a westerly direction or so up the mighty Umzimvubu River, which I traced on a map all the way up to the Lesotho border.